Click any photo to enlarge. 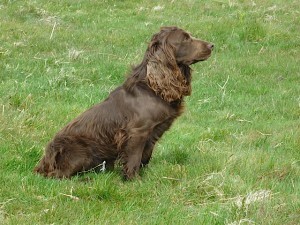 Please see our gallery for further photos of our cocker spaniels. 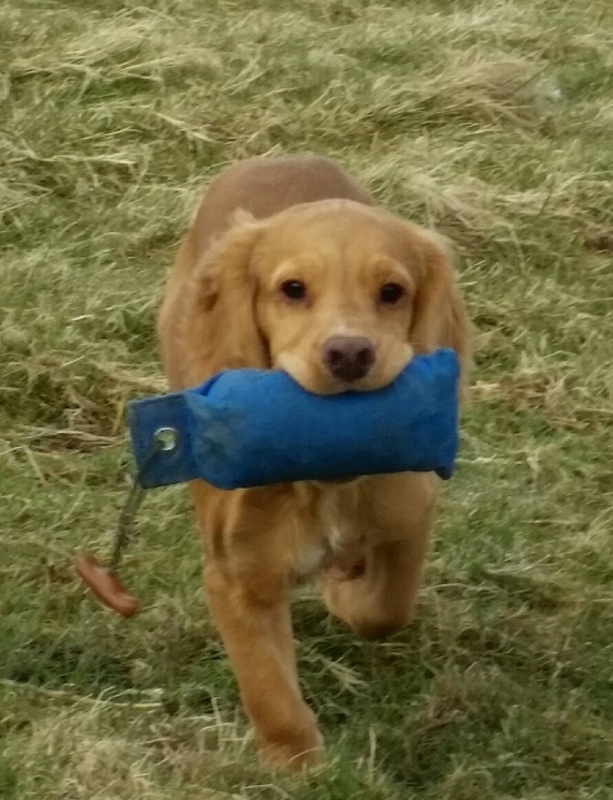 Tan is a loving Cocker who is quick off the mark and eager to please. 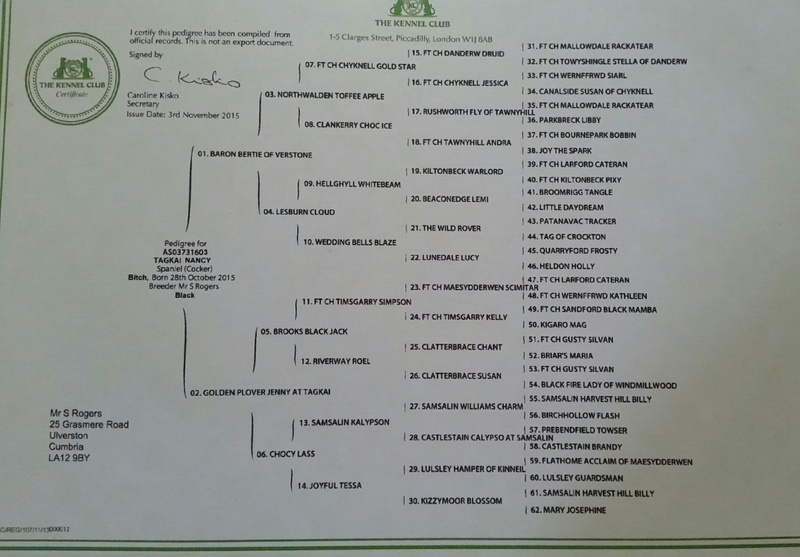 She has 41 FTCH/FTW in a 5 Generation Pedigree. 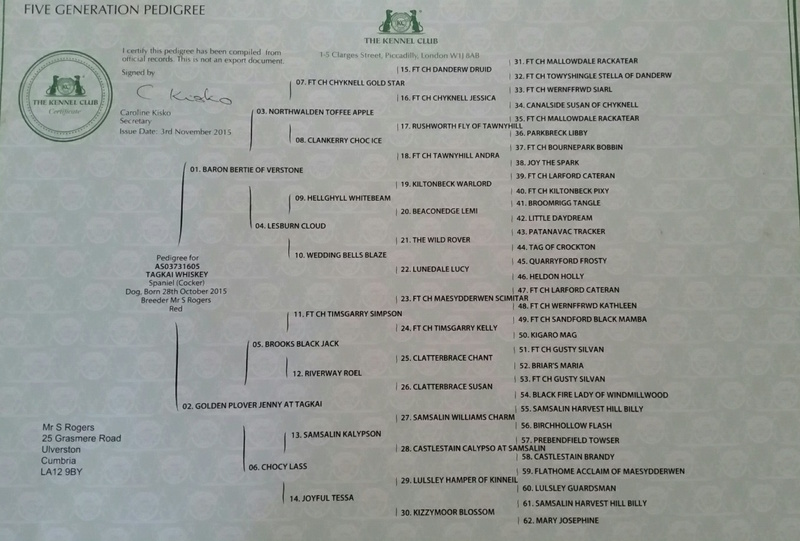 Microchipped and DNA Profiled under the ‘Kennel Club’ Scheme. Tan is Hereditary Clear of Familial Nephropathy. Interpretation: The animal has 2 normal copies of FN gene in the English Cocker Spaniel. 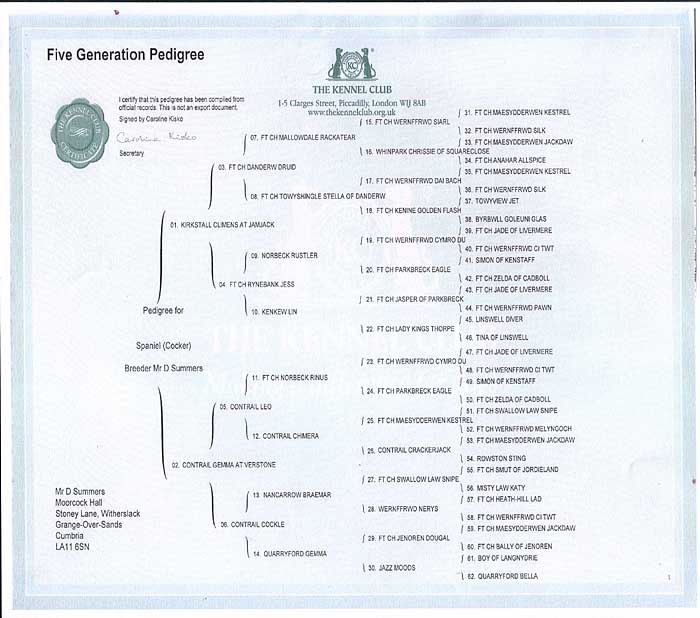 She will not develop familial nephropathy and will not transmit the genetic anomaly to its progeny. Tan is Hereditary Clear of prcd-PRA and will never develop the prcd form of PRA (progressive rod-cone degeneration form of Progressive Retinal Atrophy) and will not produce any pups affected. Tan is Eye tested clear, under the KC/BVA/ISDS eye examination scheme. 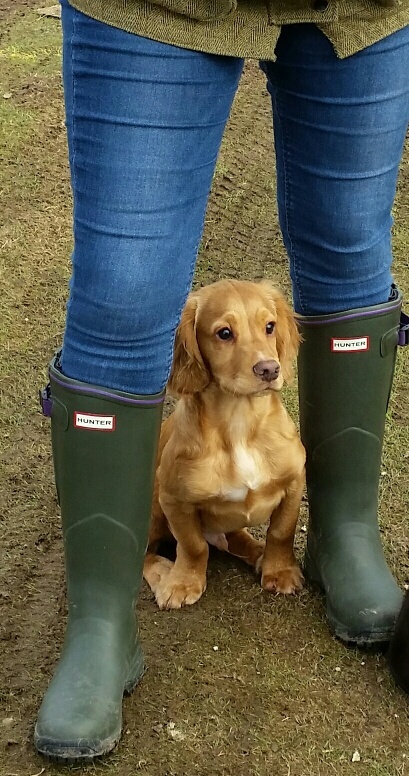 Whiskey is the brother of Nancy and is a steady little fella very soft and biddable and is keen to please with A perfect nature and temperament. He is microchipped. 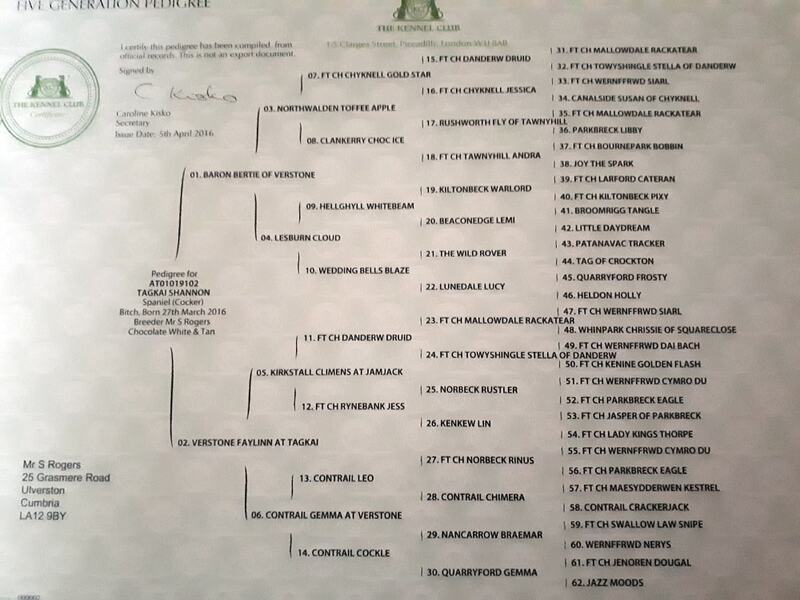 Whiskey will soon be tested under the KC/BVA/ISDS Eye Examination scheme for inherited eye disease . Whiskey is Hereditarily Clear of Familial Nephropathy. 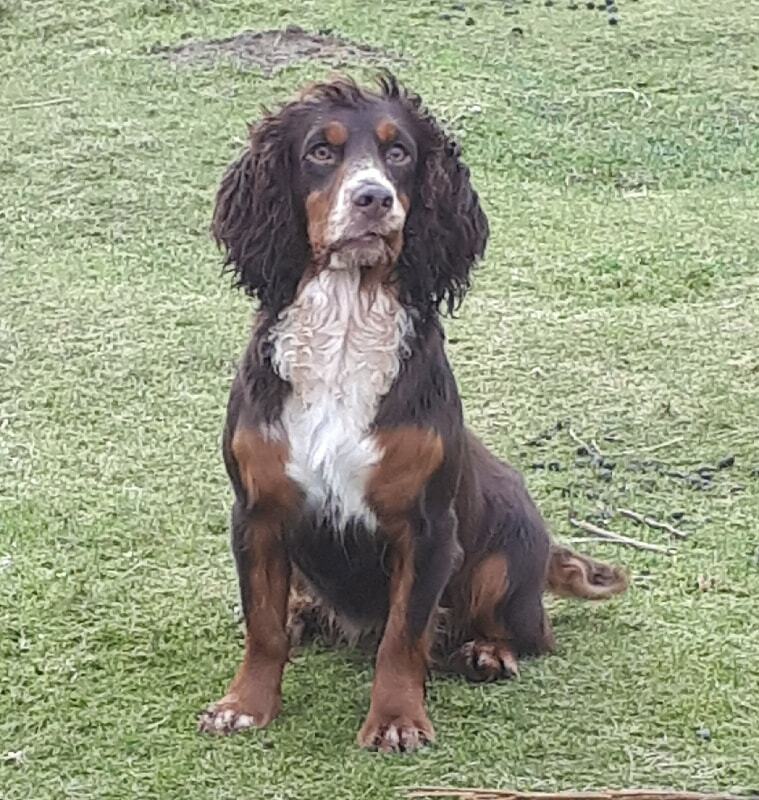 Interpretation: The animal has 2 normal copies of FN gene in the English Cocker Spaniel. The animal will not develop the familial nephropathy and will not transmit the genetic anomaly to its progeny . Whiskey is Hereditarily Clear of prcd-PRA. This dog will never develop the prcd form of PRA (progressive rod-cone degeneration form of Progressive Retinal Atrophy) and will not produce any pups affected. WHISKEY IS AVAILABLE FOR STUD. 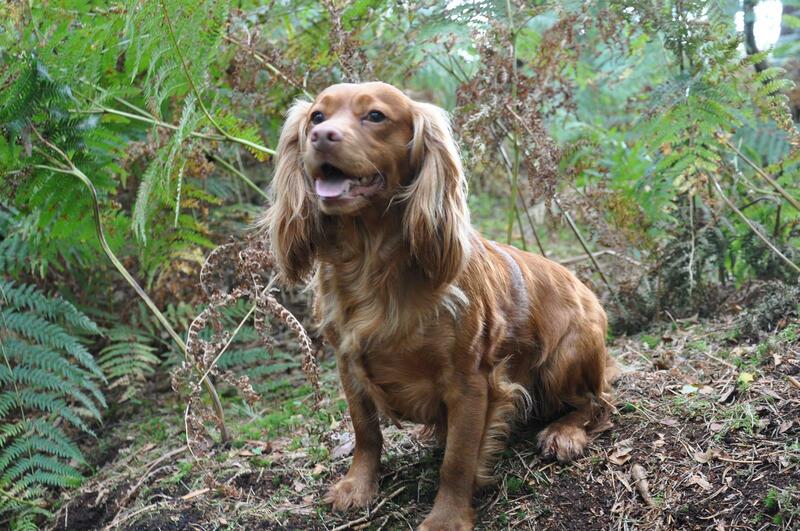 Cara is a Fox Red coloured cocker and is a loving Cocker who is quick off the mark and eager to please. Cara is microchipped. 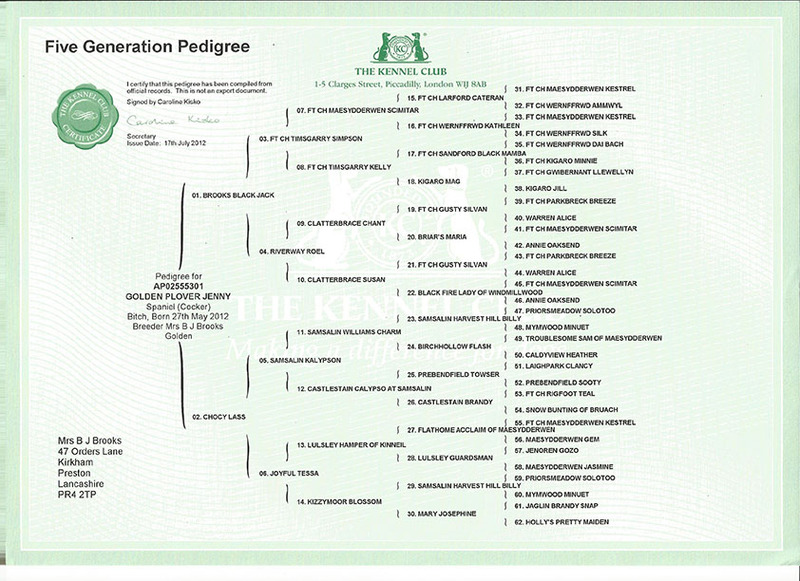 DNA Profiled under the ‘Kennel Club’ Scheme. Clear of Familial Nephropathy. Interpretation: The animal has 2 normal copies of FN gene in the English Cocker Spaniel. The animal will not develop the familial nephropathy and will not transmit the genetic anomaly to its progeny.Cara is Clear of prcd-PRA. This dog will never develop the prcd form of PRA (progressive rod-cone degeneration form of Progressive Retinal Atrophy) and will not produce any pups affected. Cara is Eye tested Clear under the KC/BVA/ISDS eye examination scheme. 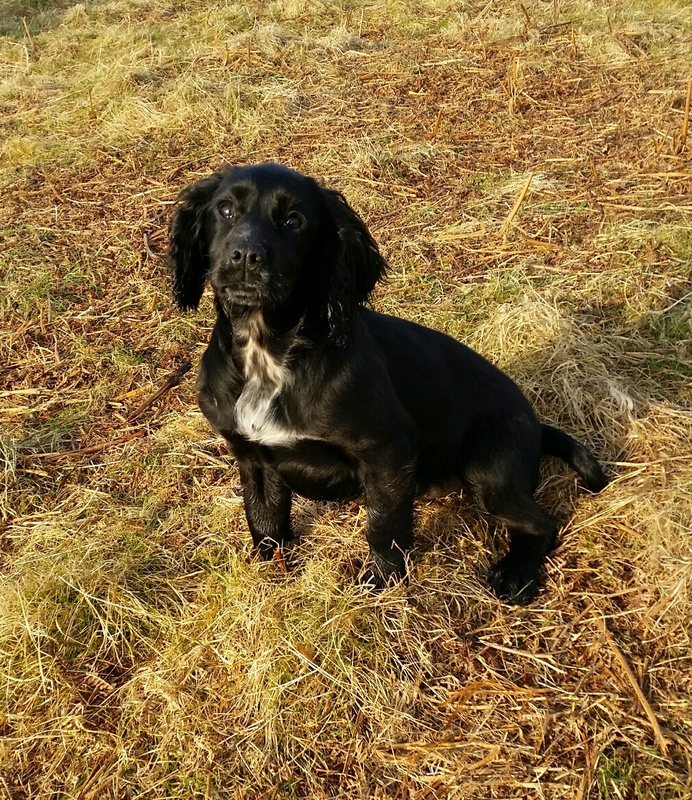 Nancy is a loving Cocker who is quick off the mark and eager to please and at 5 months she is retrieving dummies and coming back on the recall . She is Microchipped and Nancy is Hereditary Clear of Familial Nephropathy. 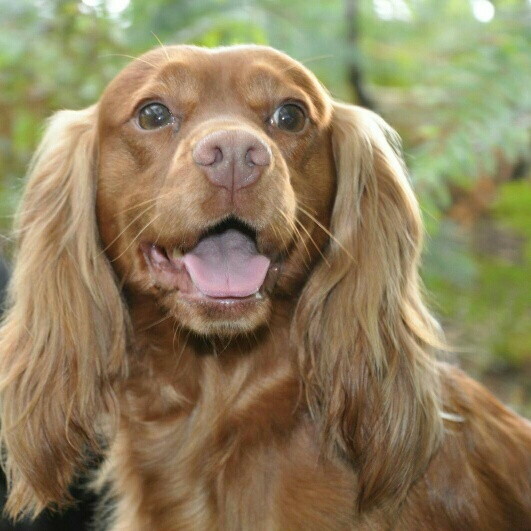 Interpretation: The animal has 2 normal copies of FN gene in the English Cocker Spaniel. She will not develop familial nephropathy and will not transmit the genetic anomaly to its progeny. Nancy is Hereditary Clear of prcd-PRA and will never develop the prcd form of PRA (progressive rod-cone degeneration form of Progressive Retinal Atrophy) and will not produce any pups affected. Nancy will soon be Eye tested, under the KC/BVA/ISDS eye examination scheme. 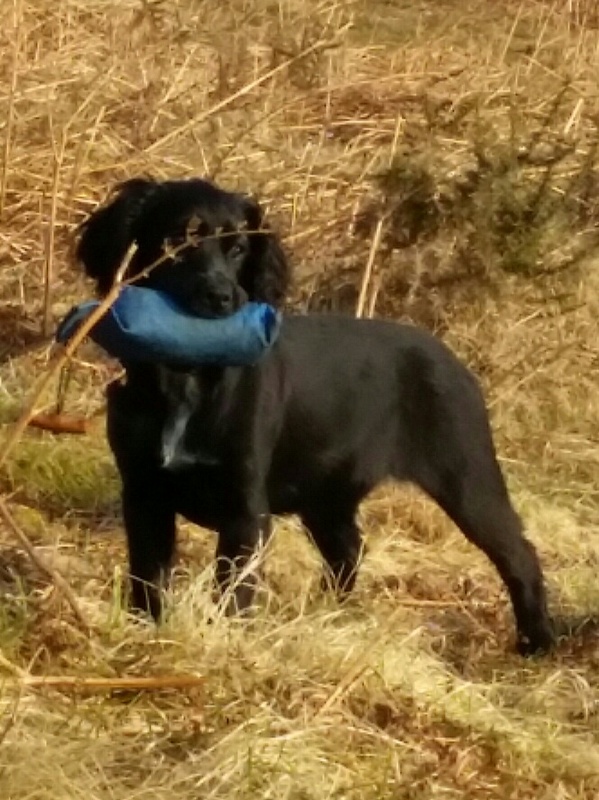 Throughout Shannons training, she displayed a lot of natural talent – able to hunt, mark and retrieve well. Her progress was excellent and she continues to display an eagerness to work, and importantly, to please. 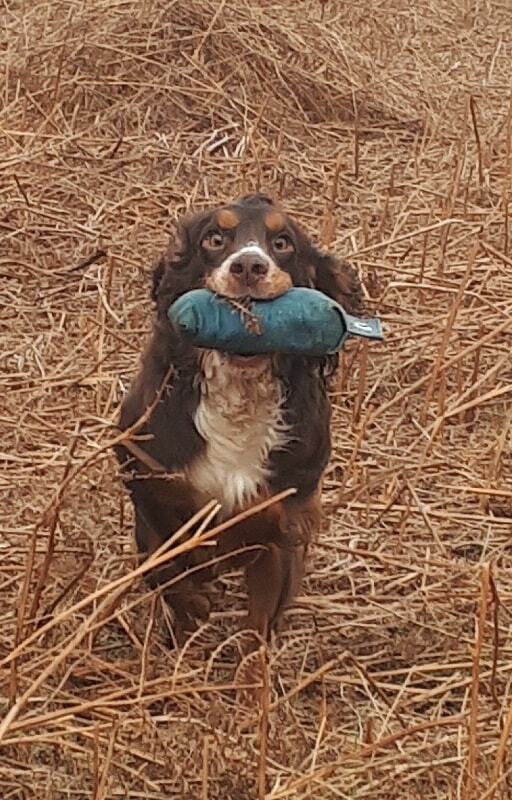 During the Shooting Seasons she has worked with me in the picking up team. 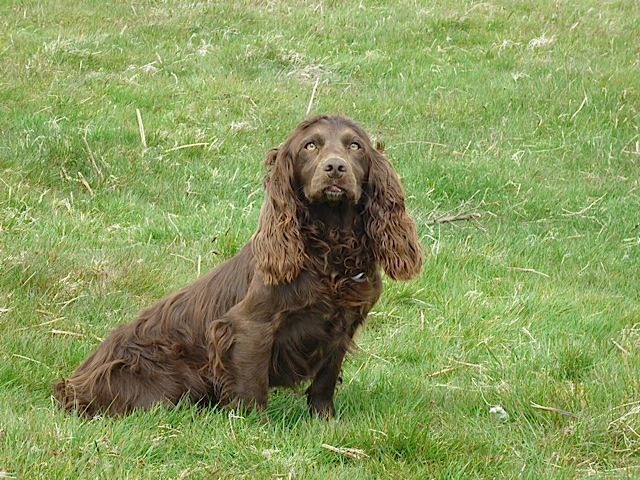 Shannon is Microchipped and is Hereditary Clear of Familial Nephropathy. Interpretation: The animal has 2 normal copies of FN gene in the English Cocker Spaniel. She will not develop familial nephropathy and will not transmit the genetic anomaly to its progeny. Shannon is Hereditary Clear of prcd-PRA and will never develop the prcd form of PRA (progressive rod-cone degeneration form of Progressive Retinal Atrophy) and will not produce any pups affected. Shannon will soon be Eye tested, under the KC/BVA/ISDS eye examination scheme.